The downfall of most flightbags is that they provide too many pockets and compartments that I can never find what I am looking for easily. Paul suggest pilots with these types of bags "throw out that over pocketed trapper keeper and take pride in what you pack your travel essentials in". The only downside I could find in the classic flight bag was that it has three buckles, which is fashionable but makes getting in an out of the bag a little time consuming. This was not a design flaw so much as Paul ensuring he developed something beautiful "It's an attempt at highlighting style over function and craftsmanship over mass production." Sounds like a reasonable tradeoff for someone like me who flies for recreation and is not in an out of the bag all day long seven days a week. The bag worked for my purposes and surely looked nicer than my previous bag. Sadly, I don't think I fly frequently enough to justify using this bag solely for flying. Instead I think I might use this bag for commuting to work knowing that each time I look at it I will evoke a feeling of that Pan Am era of travel and flying. Love the blog AND the bag. 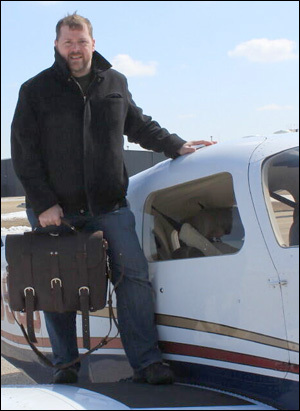 As a professional pilot for 20+ years I love the look of the bag but would have some concern for the buckles getting caught on things and being dificult to get into. Still there is nothing like the look and feel of a leather flight bag. How to you get online to order this bag. Every time I try, I get a message that they are doing a little maintenance and will be up in no time. "Hears one from downunder".I first came across the Classic flight bag.while doing some training in the US,a few weeks ago.I loved the look,and feel of a truely iconic old fashioned,and historical pilot accessory in the form of the Classic Flight bag.it is now being carried and used while operating my Learjet 60,and PC12.It has caused some really good comments from my aviation friends. Thanks for the reply.I notice that the Classis Flight Bag is now available over in the US again.A bit "bloody" expensive though,at $1700 plus.I have managed to source a similar bag over here in Australia from a very high range leather manufacturer.My friends now have them,and very impressed they are.My bag has been all over the place. I am Corporate pilot,for a company over here.We operate a Learjet 60,TBM 900,Bombadier Global Challenger (aka Gulfstream),and a Augusta Westland 139 Chopper,all over the South East Asia,and the Middle East region. I have been following this thread,re the "Classic Flight Bag",for sometime now,all the way "downunder" here,as you would know it as Australia,In all that time I have noticed that all the posts on this thread,seen to have nothing to do with the thread subject,the "Classic Flight bag".Am I missing something.